Senghor might sound as a familiar name to you: Maurice Sonar Senghor was indeed the nephew of Léopold Sédar Senghor, the first President of Senegal after the country’s independance. Maurice Sonar Senghor was born in 1926 in Dakar into an aristocratic family. In the mid 40’s he moved to Paris, where he quickly dropped out of studies to enter the National Academy of Dramatic Arts. In post-war Paris, he met several West-African artists and founded his first band in 1948 with two Senegalese fellows, Moka Bock and Jacques Mello Kane. The latter turns out to be the co-director of Afrique-sur-Seine, a 1955 short-movie about African students living in Paris. This trio quickly met success among the Paris West-African diaspora thanks to its performances based on dance, poetry and music from Senegal, Guinea and Gunea-Bissau. It was soon joined by other musicians and the band was renamed “Sonar Senghor et ses Siccos” and finally “Sonar Senghor et sa Troupe“. An album called “Lost Africa” was recorded in the early 50’s but was only released in 1997 on the American Rykodisk label. After a few years touring France and Europe with his band, Sonar Senghor went back to Senegal in 1955 to become the director of the Palace Theatre in Dakar. He later played a very active role in the development of theatre in Senegal by creating the Daniel Sorano National Theatre in 1965. You will find more details about his biography in this article (in French). This very percussive song presented as a piece of Guinean folk music is called Samsee and was recorded in 1950 in Paris. It actually sounds closer to Gorée Island’s Assiko style, featuring a solo singer leading a call-and-response vocal interplay accompanied by an ensemble of four different-sized goat skin drums (Tintin, Rouling, Contrebasse and Basse) and a rattling stick (Chacha). You can read this paper for more details about Assiko music. 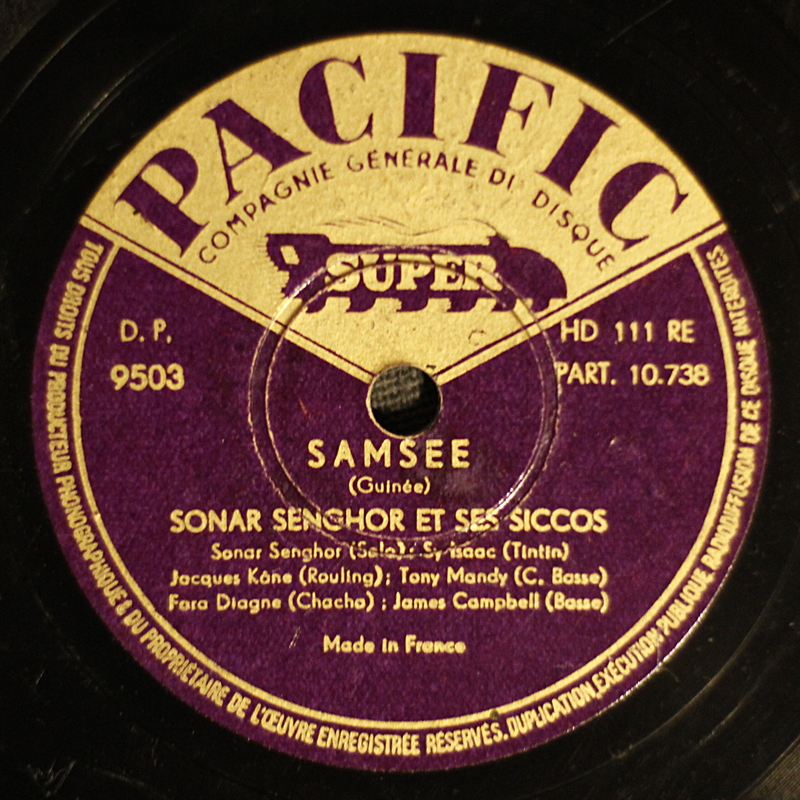 This 78 rpm record released on the French Pacific label, which, besides French music and jazz, also published several West and North-African recordings. Enjoy! [Update Nov. 5th 2013] : According to Meadoweaver, “the album that was called ‘Lost Africa’ on CD was released on vinyl by various labels, under different titles in the US and France, as far back as the early 1950s. For example, African Tribal Music & Dances – Counterpoint CPT 513“. Thanks to him for this precision! Check out his recently launched blog dedicated to African 78rpm records, some great sounds there: http://african78s.wordpress.com. Great stuff! By the way, the album that was called ‘Lost Africa’ on CD was released on vinyl by various labels, under different titles in the US and France, as far back as the early 1950s. For example, African Tribal Music & Dances – Counterpoint CPT 513. Thanks for this precision, I just updated my post!